08/26/11 Live MUVE-along Show, abridged. Today's guests Rose and Wallen help me demonstrate how easy it is to dance for good health at home. Masquerading as clowns brings special freedom -- it shakes off whatever inhibitions we might have about moving freely to the music. It certainly got us three clowns into the dancing groove. In addition to the outfits we brought toys! Hats, scarves and plates can be found at home and are perfect toys to ignite creativity for a dance improvisation. Let yourself be inspired to get up and dance along with our simple dance moves. 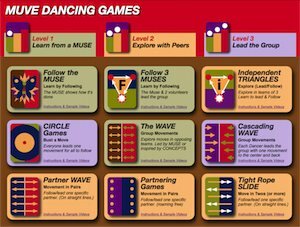 The MUVE Method helps people realize that they actually already know how to dance. It offers a simple and easy way to get moving. With continued practice, inexperienced dancers can develop confidence. Creativity blossoms when the dancer "gets the hang of it" and starts to experiment.